Casting our mind back to February 25th, a beautiful sunny morning sandwiched between the intense wet weather period, OCCA had the opportunity to host volunteers from three different Rotary groups for a tree planting event at the Common. 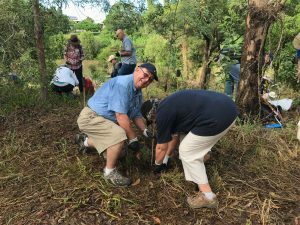 Around 40 members from the Brisbane Taylor Bridge, Brisbane Inner West and Archerfield Rotary clubs joined dedicated OCCA volunteers at 7am to plant 240 seedlings. It was no easy feat, but after an hour’s work the banks of the Oxley Creek Common were harbouring new life. The generous clubs then threw on a breakfast BBQ for all involved and made our morning one to remember. Our Partnerships Manager and event organiser Camilla considered the day a huge success and enjoyed being able to collaborate with the Rotary Clubs. We’d like to extend our appreciation and say a heartfelt thank you to those that attended the event and made it what it was. Rotary had approached us to assist with helping get their tree planting endeavour off the ground. At the beginning of last year, Rotary International President-elect Ian H.S. Riseley issued a challenge for its global constituents: plant one tree for every member of your club. Riseley, a Victorian local, lists environmental degradation and global climate change as serious issues to be given consideration in the 2017-2018 Rotary period. The clubs donated the money for the 240 seedlings along with additional funds for 12 months’ worth of maintenance for these plants. Rotary first hit the shores of Australia in 1921, and the almost 100 years since then have seen them give back to their local communities in ways no other group has. Today there exists over 1100 clubs with over 30,000 members across our continent alone. There are 1.2 million members worldwide. 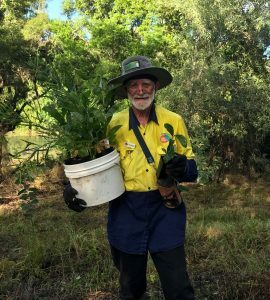 If you would like us to host your own tree planting events, please email partnerships@oxleycreekcatchment.org.au. We run a range of corporate volunteering opportunities that can be viewed under the Services tab at the top of the site.